Inspired by the award-winning Tangle Teezer -The Blow Styling Hair Brush is an innovative tool that takes hair from wet to dry. The fixed based teeth have been designed to give an unbelievable quick and smooth blow-style. Iâ€™ve been blow drying my wavy, thick, waist length hair and others for 25 years and this brush has changed everything!!!!! What takes straightening hair a long time, is the amount of times you need brush a section out before it can be properly straightened/blow dried. 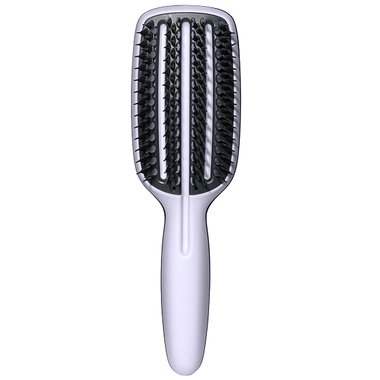 This brush has firm teeth that pick hair up at the scalp to be perfectly straightened WITHOUT hurting your scalp. Youâ€™ll understand how good this brush is when you use it. Iâ€™ve told everyone I know who blow dries their hair regarding this awesome brush. The ends of your hair arenâ€™t smooth but thatâ€™s expected, so I like using a curling wand after. Styling my hair this way lasts 4-5 days depending on how active I am. This brush has changed my life! I have med-long hair and it has really cut down my drying/styling time. I can blow dry my hair completely straight in under 10 minutes and I hardly have use my straightener to get rid of that post-blowdry frizz! This brush is great!